Arlene Phillips directs a reworked version of smash-hit new rock musical ‘27’, which runs for a strictly limited nine performances at London’s The Other Palace. 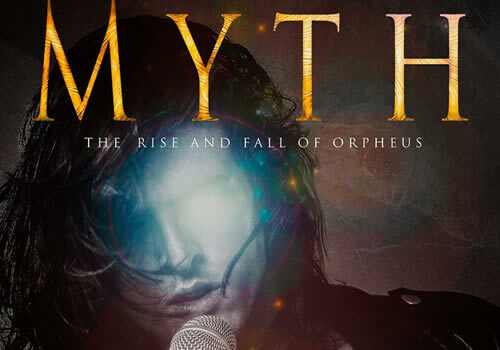 Originally premiering in summer 2016 at the Cockpit Theatre, the musical returns to the stage in a workshop version under the new title Myth: The Rise and Fall of Orpheus. A modern retelling of the well-known Ancient Greek tale of Orpheus and the underworld, the musical is a brand-new genre that is guaranteed to resonate with every generation. Examining the link between mental illness and an inescapable addiction to the music industry, Myth examines a growing cultural problem that has stolen the lives of stars such as Kurt Cobain, Jimi Hendrix, Janis Joplin, Jim Morrison and Amy Winehouse. Myth is directed by Arlene Phillips, whose credits include Saturday Night Fever, Starlight Express and Jesus Christ Superstar. Actor-turned-writer Sam Cassidy rewrites his script for new audiences. The production is semi-staged and features a live 6-piece band. Casting includes Zoe Birkett, Jaymi Hensley, Jodie Jacobs, Jodie Steele and Jessamy Stoddart, alongside Joe Burman, Richard Carson, Eloise Davies, Amy Di Bartolomeo, Lauren Ellis-Steele, Joel Harper-Jackson, Laura Johnson, Shekinah McFarlane, Matthew McKenna, Alice Martin and Damien Walsh. An intimate exploration of today’s society, drawing parallels with stories of the past, Myth: The Rise and Fall of Orpheus is set to break your heart, make you laugh and rock you to your core. Myth plays a limited season at The Other Palace from March 10th to March 17th 2018. Myth: The Rise and Fall of Orpheus may not be suitable for young children.